This week let's talk about creating a moving picture. And no, I'm not talking about animation or film. I'm talking about how to capture movement in a 2d painting. From a person walking, dancing to something more subtle like eye movement. It is quite interesting when we study the history, we notice artists were trying to capture motion way back in the stone age. 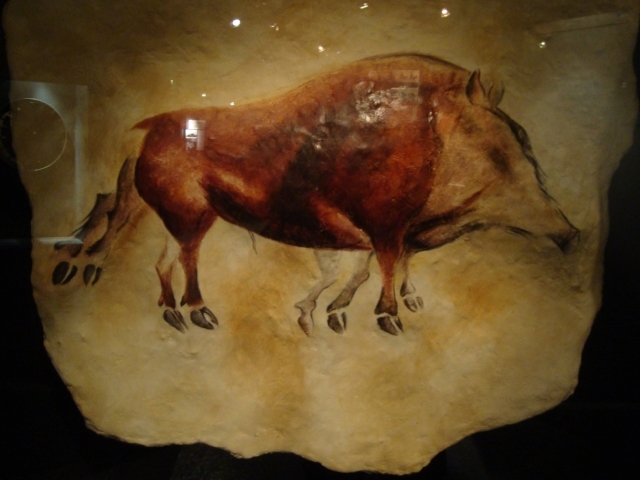 There are numerous example from the cave painting of Lascaux. We can see in both painting the animals has multiple limbs and outlines. Those artists from the past were trying to capture the motion to tell the stories. We can certainly see modern comics adapt the same idea. By drawing multiple limbs and action in a single picture. The artist is fitting multiple time frames into one image. While it looks comical and unrealistic. It does convey the message clearly. We might not want to do that in a fine art painting because it can look odd (unless you are trying to paint some funny looking abstract fine art painting). One thing to learn here is that to convey sense of motion, a perfectly still image is not going to work. Besides drawing/painting different frames of actions in one picture. Another example of artist trying to achieve movement in a still image is by using the illusion of motion blur. 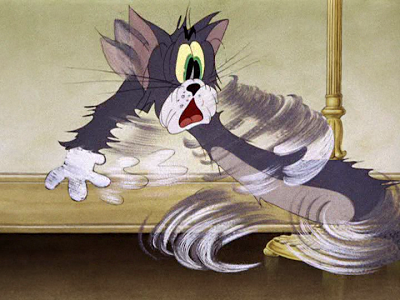 This animation still from Tom and Jerry is using that. While we can see the multiple ears and hand, we can see Toms leg and the arm has this motion lines that suggesting motion. This is mainly simulate the slow shutter speed of a camera when taking a photo. When a camera capturing a moving subject in a slow shutter speed. More light information from the moving subject transmitted to the camera. This is why sometime we get these blurry photo when we are trying to capture a moving subject. While a blurry image is not something people are intended when they are taking a photograph, it is not unusual when a photographer intentionally do so to capture motion. Take my good friend an a great photographer Oliver Regueiro's work for example. His Koi series were all taken with long exposure shots. They capture the movements of the Koi fishes beautifully. I love them much better compares to the ordinary still photo of the Koi fish. Besides Oliver, there are many photographers doing long exposure shots with waterfall, rivers, and even vehicles. Now all that being said, how do we apply those in our watercolor? It's true that painting multiple limbs and making blurry painting might not be the best choice. But we can certainly take the idea and apply to our painting. And instead of look at one of my painting, let me show you how a true master does it! Fast, confident stroke - A fast confident brush stroke can achieves sense of movement. Especially when dry brushing on a rough surface paper. When you make a fast mark, it shows speed, and speed is motion. I use that all the time when painting foliage, thin wires, and the light reflection of the car. In this case, you can see the horses' legs, feet and tails are done with these type of brush work. They feel fast, unsettled and in action! Loose, spontaneous marks - When I paint a figure walking, small bird flying in the sky, or even the eyes of my portrait. I try to keep my marks loose and spontaneous. If you paint everything too refine, it starting to look like a photograph. And that means stillness. If you are trying to paint a very still and quiet picture, that might not be a bad thing. But since we are talking about how to create motion in your painting, it is best to avoid painting too detailed and photo real. By painting loose, broken and spontaneous marks, the viewers eyes won't be fixed or settle down. Their eyes will naturally move around and read the image by combining the loose marks you made. We can see those type of marks on the figure, you can feel they are moving and turning. Let the water flow - This is EXCLUSIVE for watercolor. Only watercolor stays alive when you put down the paint, not oil, not acrylic and not pencil. If you let the water flow when you paint, let the wet on wet do its magic, you are leaving the "mark of the time". In the case of this painting, it is clear to me that he let watercolor does its work for him especially in the background and the dirt. While it might not be very obvious, it shows movement very subtly! These are just some ideas on how to create a moving painting. There are also other factors such as composition, gestures and more. We will go over those in the future.